“Green” author Sam Graham-Felsen, a Jamaica Plain native, at a bus stop on Centre Street in JP. Sam Graham-Felsen started wearing eyeglasses in fourth grade. Around that time, he also had skin-graft surgery to fix a hole in his eardrum. He’d just been placed in an “advanced work” class, and he was struggling. So his mother talked to his teacher. It’s a bit of family lore that has carried Boston native Graham-Felsen, who was chief blogger for Barack Obama’s 2008 presidential campaign, into his budding career as a fiction writer. His new debut novel, “Green,” is the story of a very perceptive awakening. The title character, David Greenfeld, is a middle schooler growing up in the early 1990s in Jamaica Plain, wedged between the Arboretum and the projects. His social-activist parents enroll him in a public school where he’s one of the few white kids. The things that Dave sees and hears — and feels — about race, hormones, religion, and basketball, not necessarily in that order, make for a comically geeky coming-of-age story that brims with anxiety, resentment, and a surplus of compassion. “I saw a friend get thrown through that window,” says Graham-Felsen, gesturing toward a big glass pane at the front of City Feed and Supply, one of the anchors of the new, hipsterized Jamaica Plain. Back in the day, he notes, City Feed was a video-rental store, and the neighborhood was a lot rougher. Like a lot of first-time authors, Graham-Felsen relied extensively on his own experiences in creating his characters and his story. But “Green,” he’s quick to say, is not strictly autobiographical. For one thing, Dave’s fraught relationship with his short-lived best friend, a bookish black kid named Marlon, is a composite drawn from “a dozen” or so of the author’s former schoolmates. One of the book’s preoccupations is the notion of privilege. Dave and Marlon both stress about the test that could get them into the Boston Latin School, where their dreams of going to Harvard might have a fighting chance. In real life, Graham-Felsen did end up at Latin, and then at Harvard, followed by the MFA writing program at Columbia University. In 2008, after interning at The Nation, he joined the Obama campaign. “My life turned out pretty good,” says Graham-Felsen, who is married to magazine editor Sasha Weiss and is currently a stay-at-home dad to their toddler son in Brooklyn. But he’s not so sure about a lot of his former classmates. He’s lost track of many of them. One was murdered by an ex-boyfriend. “It makes me sad to think about the different paths that kids take in life,” he says. One of the pleasures of “Green” is the ridiculous lengths young people will go to try to fit in, or at least not stand out. Writing in the first person, Graham-Felsen has Dave talk in a riot of language that’s part hip-hop, part nerd boy, and part pure imagination. The latter was a big inspiration on Graham-Felsen, he says, as was “The Fortress of Solitude,” Jonathan Lethem’s 2003 novel about a white boy and a black boy growing up together in Brooklyn. “My favorite books happen to feature 12-year-olds,” says Graham-Felsen, though, with their “inside jokes and irony for an adult audience,” they’re not exactly young adult novels. After working on the Obama campaign, he could have pursued a career as a political essayist, but he chose fiction. “With the best writing, you risk offending someone,” he says. “I wanted that freedom. . . . Instead of writing one big thing about race, I wanted to write 100 things about race.” Not to mention topics including boyhood, masculinity, ancestry, disabilities, and the devastating effect on a 12-year-old of owning the wrong sneakers. 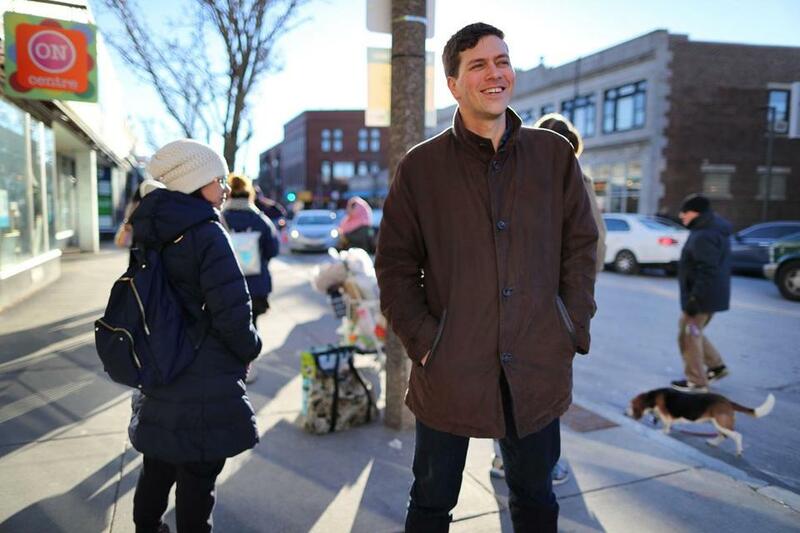 Felsen’s sitting on a couch inside a Jamaica Plain bookshop alongside his wife, Tolle Graham, who works as a community educator-organizer for the Massachusetts Coalition for Occupational Safety and Health. They’ve stopped by to pick up their son, who just finished signing copies of his book. Holden Caulfield might have asked the same thing.